Home » Sandra J. Iannotti, M.D. 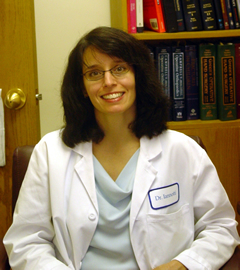 Dr. Iannotti joined the practice in 2001. Dr. Iannotti is a board-certified orthopedic surgeon and a Fellow of the American Academy of Orthopedic Surgeons. A native of Long Island, she went to Syosset High School and received her undergraduate education at Duke University in the field of Biomedical Engineering. She attended Cornell University Medical College, completed her orthopedic residency training at Tufts University Orthopaedic Residency in Boston, and trained in a Sports Medicine Fellowship at Union Memorial Hospital in Baltimore. In addition to practicing general orthopedics, Dr. Iannotti specializes in arthroscopic procedures of shoulders, knees, and ankles. She has published several book chapters on arthroscopic techniques and is an active member of the Arthroscopy Association of North America and the American Orthopedic Society of Sports Medicine. She has a special interest in adolescent sports medicine.